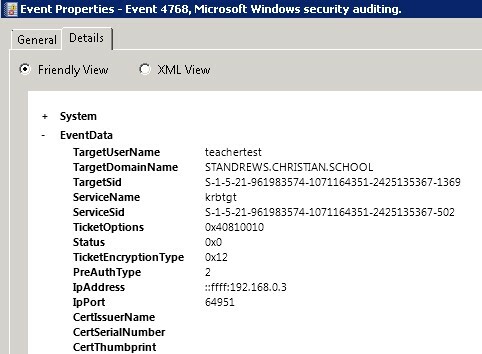 I support a school and they have been running UT with Logon Scripts connector for a number of years. Following some isolated performance issues with the scripts, today I tried to install AD Monitor for them. 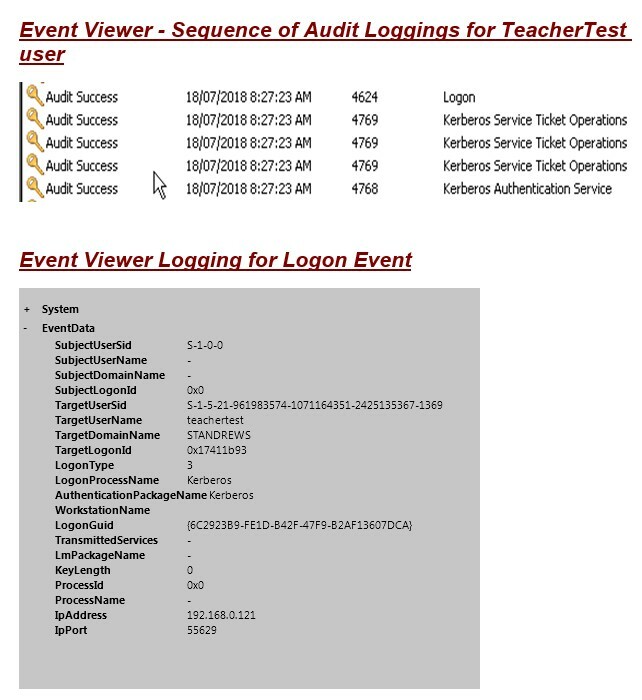 I installed AD Monitor and when the TEST button is clicked it reports "SUCCESSFUL", and I can see LOGON / UPDATE API events in the Directory Connector log for the Admtest user. However, no user events are getting into the API logs when real users log on. As per the installation notes, there is no option in my Local Security Policy to enable Advanced Audit Features. Given that I can see API events from the TEST button, would this behaviour be consistent with the known Audit Features issue ? and if so, is there any work-around (we don't have any other AD server) ? Do you see the computer login events on the AD server? Event 4768 A Kerberos authentication ticket (TGT) was requested. Event 4769 A Kerberos service ticket was requested. Event 4624	An account was successfully logged on. This same Audit sequence gets repeated for both the user and the computer, both streams show AUDIT SUCCESS. I have attached a screenshot of some of these loggings. No, the test button generates a "fake" the event. It doesn't send anything to the AD server to do a "true" login. From your log the AD server is generating event #4768 which is what the AD monitor looks for. So it certainly looks like it should be working. In the AD monitor install directory there should be two log files (log.txt, loginlog.txt). Do you see anything in those logs? Thanks. I can only see one logfile (log.txt) in the folder. I did not find loginlog.txt. I uninstalled and re-installed but no change. I didn't see any error messages in the log file, below is a snippet of the last few entries. The usernames don't have dollar signs ($) in them, do they? The monitor will ignore them. Do you have any IP or user exemptions defined? Thanks. Usernames definitely do not have any $ signs in them. Below is a typical 4768 event from a user. Look at /var/log/uvm/apps.log. Tail it when logging in and see if the app showing any kind of rejection message on logins. Thanks. I am currently supporting the school remotely, and won't be onsite for 1 week. I normally use an RDC connection to the Domain Controller and I access UT through a browser session from there. Last edited by Pilotpak; 07-19-2018 at 08:40 PM. Hi, I notice that there are 2 Debug / output settings in the AD Monitor ini file that are currently set to False. Would turning these Debugs on help us get some more info on the error ?